This is a very dramatic, but striking, looking wedding gown! By far one the most unique wedding gowns to have been donated to us, and possibly the oldest to date. I do not know much about the history, by judging by the design and other elements I estimate it was made around the 1960’s. The wedding gown has long sleeves that is finished off with lace and button details. The actual gown it itself is made in white bridal satin in a pencil style. Then there is the cloak; so dramatic, so striking and so very regal. It is not a separate piece though, it has been sewn into the actual wedding gown. 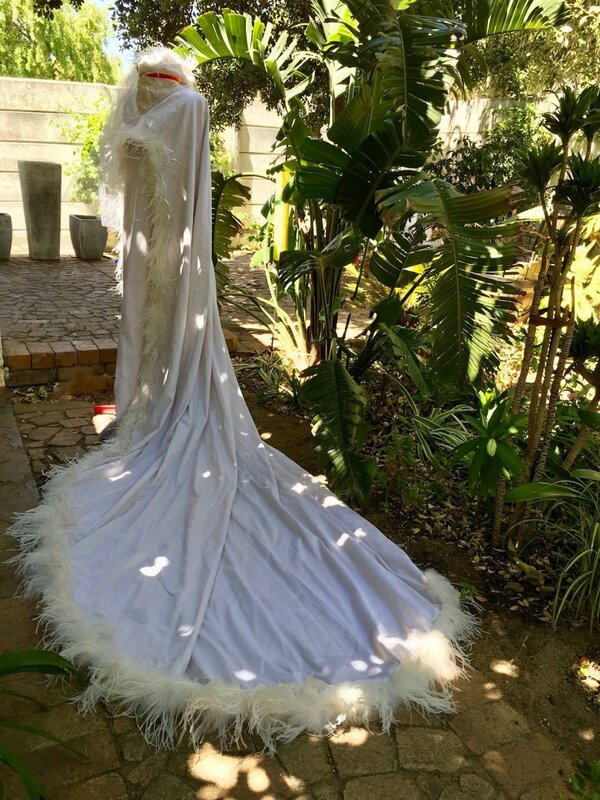 The cloak sweeps behind the bride in a cathedral length train and is finished off with meters of ostrich feathers and a touch of bead detail. Thank you Marona for donating your beautiful wedding gown to us.